Research has shown that up to 75% of the preemergence herbicides broadcast-applied to container nursery crops falls to the ground between the pots. As the size of the crop increases, the space between pots increases – resulting in greater and greater percentages of the applied herbicide falling between pots. 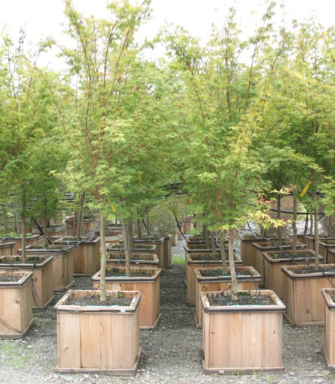 Consequently, in container production of large woody nursery crops it is common to treat individual pots rather than making broadcast applications. However, applying preemergence herbicides to individual pots uniformly and accurately is difficult to achieve. 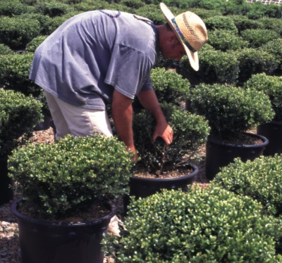 When growing in large containers, it is common to apply PRE herbicides by hand. Treat uniformly and accurately. Remember, these are herbicides. Wear your pesticide applicator PPE! Large containers can also be treated with a sprayer if the crop canopy is not covering the subsrate, and if plant spacing allows passage through the block with a sprayer. The best approach to accurately apply granular herbicides to individual pots is to measure the correct amount of herbicide for the surface area of the pot, place this amount of herbicide into a hand-held shaker jar, then apply the granules as uniformly as possible. To achieve a uniform spread – apply the granules lightly, making at least 4 passes over the entire surface. Table 1 offers a guide for the amount of herbicide to needed on different sized pots to achieve labeled doses of 100, 150, or 200 lb product per acre. For example: if you wish to treat a trade #10 with 150 lb/A of a granular herbicide, you would measure 2.1 grams of herbicide and uniformly spread this amount on the surface of the container. That’s a tiny amount… you might say. To make this go faster in the field, weigh this amount of herbicide at your pesticide storage area and find a small scoop or measuring spoon you can use to volumetrically measure the herbicide in the field. Obviously, the larger the pot, the greater the volume of herbicide, and the easier it will be to measure and apply granular herbicides accurately and uniformly. Table 1. Individual pot treatments – amounts (grams) of granular herbicides to apply in order to achieve doses equivalent to broadcast applications of 100, 150 or 200 lb product per acre. In very large containers where the substrate surface is unobstructed by over-hanging crop canopy, it may also be possible to make individual pot treatments with a sprayer. The selected sprayer should be equipped with pressure control / monitoring devices to ensure consistent flow rates. With water in the sprayer, use a stop watch to determine how many seconds it takes to uniformly moisten the surface of the substrate in the pot. Do this step as many times as is necessary to ensure a consistent application volume can be achieved on each pot. The volume applied to each pot should not vary by more than 10% from the average of at least 10 test runs. Use a measuring cup or graduated cylinder to measure the amount of water applied per pot. This is the amount per pot. Calculate how many pots you can treat with one gallon of water. For example: if it takes 1 oz of water to treat one pot, then you should be able to treat 128 pots of this size using one gallon of spray. Use the tables below to determine how much herbicide you would add to one gallon of spray. Assume you are treating a Trade #25 container which is 23 inches in diameter. This pot has a surface area of 2.885 square feet. Assume your spray calibration determined you would need 1 oz of spray to treat this pot. If you wish to treat this pot with Marengo herbicide at 10 oz product per acre, you would need 0.0092 ml per fl oz of spray. In other words, in one gallon of spray mix (128 oz) you would add 1.2 ml of Marengo SC. Assuming you have a 4-gallon backpack sprayer, you would add 4.8 ml of Marengo SC to 4 gallons of water. This should treat 512 containers. These calculations would need to be repeated and customized for each size container and herbicide. Table 2. Individual pot treatments – An example of a spray applied, liquid formulation: Marengo SC. Table 3. Individual pot treatments – Sureguard DG herbicide.